In order to remove it, you'll need to locate the body by following the smell. First, air out the house, then turn on the furnace fan and go from register to register. It's most likely that the carcass is near the register where you get the strongest scent of decomposition. Remove the register cover and shine a flashlight into the opening to see if you can spy the carcass in the duct. Depending on how far it's situated from the register opening, you may need to use a wire coat hanger or your vacuum hose to pull it close enough to reach. With rubber gloves on, carefully scoop the dead rodent into a plastic trash bag, tie it securely and dispose of the carcass. Then, spray the duct's interior with a disinfectant spray and replace the register. If the body is in a spot that's impossible to access, or you'd rather not deal with the problem yourself, contact a reputable HVAC pro for help. Their technicians may be able to handle the task, or they may advise you to hire a pest removal company with specialized tools and expertise. 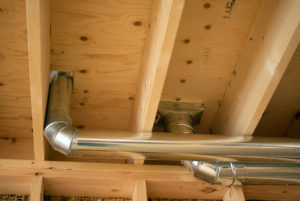 Regardless of who handles the cleanup, an HVAC pro will likely recommend scheduling a ductwork inspection to locate and seal any rodent access points, then getting the ducts cleaned and sanitized. If your clean ductwork has been contaminated by a dead rodent and you need expert help, contact us at Hartman Brothers Heating & Air Conditioning. Our goal is to help educate our customers in New Haven, Indiana and surrounding Fort Wayne area about energy and home comfort issues (specific to HVAC systems). For more information about other HVAC topics, download our free Home Comfort Guide or call us at 260-376-2961.